If you were playing along on Tuesday when I talked all things beauty and the Christmas party, you’d know that it’s go time for me tomorrow night. Yes, it’s Mr SY’s office party. It will be HUGE and bacon will definitely be required on Saturday morning. We are staying over in the big smoke and have booked a hotel within walking distance to avoid the ultimate party killer, the post-event cab wait. There is nothing worse coming out of a fun event where you’ve danced too much and availed yourself of the hospitality, only to wait for an hour or more for a ride home. Not this year. We will be the smug ones walking away from the event in the knowledge that we are just minutes away from some bed action. SLEEP, people. Let’s keep it clean. I’ve worked out my outfit – of course – and details will be on the blog on Monday in a special Christmas party edition of The Model and Me. 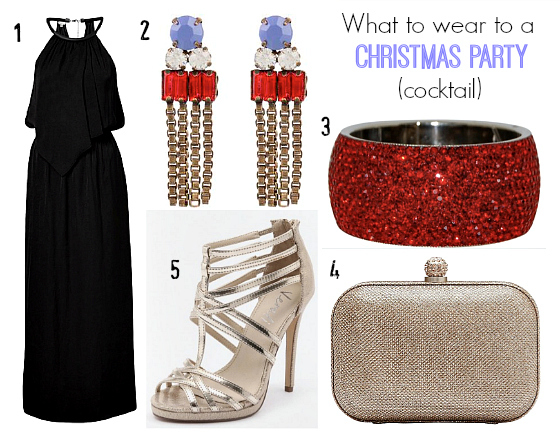 In the meantime, I’ve put together this year’s guide about what to wear to a Christmas party, with style ideas below for a cocktail, casual and work lunch event. There were more than a few questions from the SY Facebook community on this topic – as well as what to wear Christmas Day (stay tuned for a blog post on that one). I answered most of the questions on Facebook, many with links of examples of clothes to consider buying. So make sure you check it out here if you’re wanting more ideas. 1. Think of your centre piece garment as an unadorned Christmas tree. It looks fabulous on its own but you know that with just the right amount and type of decoration you will light up the room. In a good way. A dress is always a good idea. 2. Those decorations, those “baubles” need precision placement. Not unlike if a Christmas tree is decorated “correctly”. In our house “correctly” is the only way a Christmas tree is to be decorated. You don’t want to over-state the statement. Give people at your party a focal point in your outfit – near your face or on your hand (you know the one you do the talking with … or is that just me?). 3. There needs to be a comfort factor. We’re not talking trackies but you don’t want to be fiddling with the lining of your dress and worrying about VPL should you get trapped in a deep and meaningful with your boss. Or in my case, my husband’s boss. Not cool. 4. If buying something new, buy something you know you can wear again. Better still, have the next occasion earmarked for its next outing. Just dress it up a different way. 5. Don’t forget about the beauty bits. This post has the low-down on how to prepare a party makeup look and prioritise any beauty out-sourcing. See anything you like? Any funny Christmas party stories to share from years past? I have two casual Christmas parties on this weekend, planning to wear a (different) maxi dress to each of them. Not too many glam events in my life these days but if there was I love your cocktail outfit! Hope your parties have been fun Janet! Again, perfect timing Nikki. Just got a new job so I’m happily planning my work Christmas party outfit! Oh good timing! Have fun with the planning and the party! Ohhh that Eb&Ive dress is gorgeous – love the colour (of course)! That would be a comfortable little number for Christmas Day too. And you know I’m partial to a bit…who am I kidding…A LOT of bling so Peter Lang earrings and Peeptoe bangle are speaking to me! Oh my goodness, I HAVE that Eb&Ive dress, but in blue. How did I not spot it in the divine peachy colour?! Bling it up baby! And I did spot that Target dress when doing this post but not many sizes left online so left out. Hopefully some in store. Christmas parties are pretty low key for us … though it is still nice to wear something nice. I am trying this year to shop from my wardrobe for the parties and saving a new outfit for Christmas day. 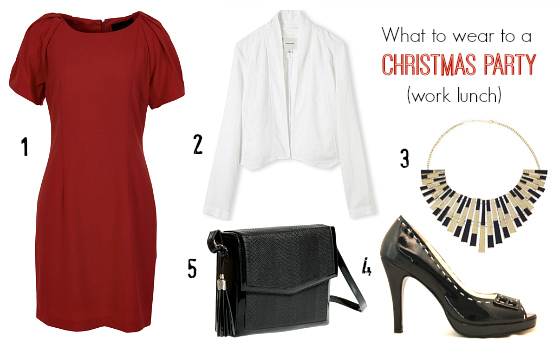 I think that’s a good plan of attack Kelly – I’m all for a new Christmas Day outfit. 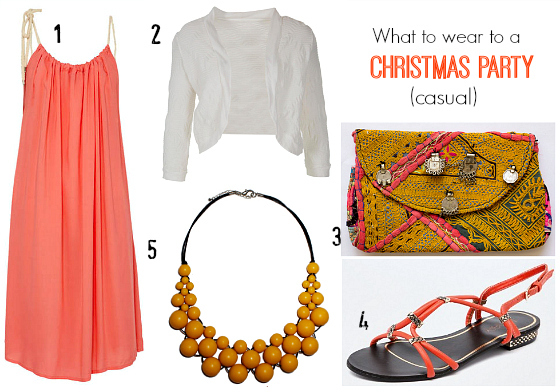 I love all the outfits but No1 I really like cause it is orange and it has flats I really love those sandals! I actually just bought a new statement necklace and it adds a pop of colour to dresses. I am sure your outfit will be stunning Nikki and Can’t wait to see what you wore and very sensible indeed about staying in the city,my husbands work always pays for a taxi home from the city to our place but I always fall asleep on the way home as it is quite a distance ( about $250 worth of cab) I might look into staying in Darling Harbour this year. I do have a funny story for you at the time was very embarrassing for me though,we were at hubbys posh do in the city at a Posh restaurant and I wore these new red shoes that were a bit too high for me anyway I was walking back to our table from the dance floor slipped over and flashed my knickers to the whole place,this was about 8 years ago but I still cringe at what his boss thought.Have a wonderful time at your Party Nikki! Oh Lisa, note to self … I will walk carefully tomorrow night! And yes, we are given a cab fare to and from as well but it’s no fun waiting for the cab when the party is over. This will be way better! Yes do walk carefully Nikki:)Enjoy! Oh thank you so much – this means the world to me. It is a bit of study and observing and then adapting to your personality and lifestyle. I never expect anyone to adapt my style completely but hope that I give the tools so they can find theirs. Good luck with the “tinsel” – that’s the fun bit if you’ve got the base sorted. Hi Linda, good question! I think you mean 1 and 3? You have a couple of options – to go for a strapless bra or wear a normal bra in similar colour (thinner straps) and let it show. I do this all the time with my strappy dresses – making sure the strap works in with one of the colours in the dress. Ohhh thanks Nikki. Great options. Have fun at your Christmas party. Can’t wait to see your outfit.